KKFI ascertainment forum on Thursday, 10/26 at 6:00 PM sponsored by the United Minority Media Association. KKFI Annex room at 39th and Main. Friends of Community Medias a co-sponsor and will have information about net neutrality and other activities coming up. M.C. Richardson is the coordinator. All are welcome to bring diversity to the airways. The FCC just ended a decades-old rule designed to keep TV and radio under local control – link below. 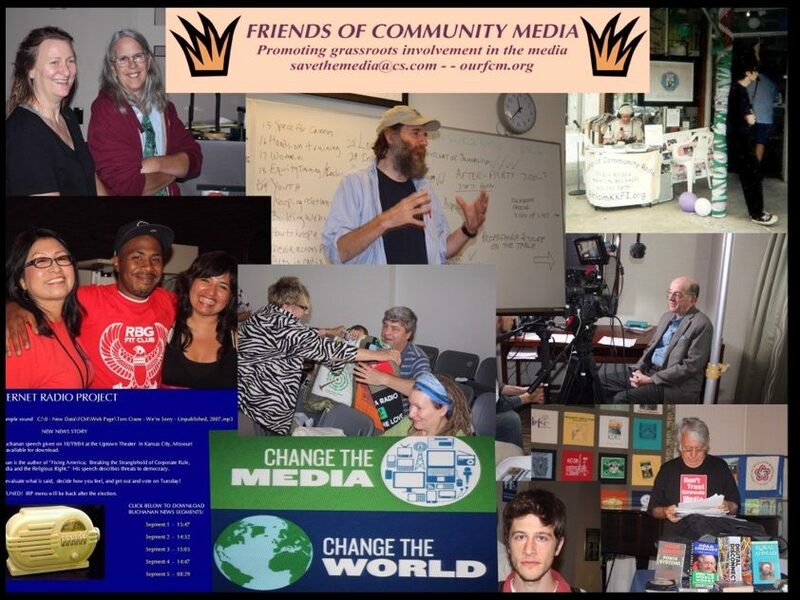 Mission statement: The mission of Friends of Community Media is to promote non-commercial community-based media of all types, to educate citizens on the nature of the media, and to encourage all media to be responsive to the public in their coverage. including "The Communication Crisis in America, And How to Fix It"
catalyze improvements to media and in the greater Kansas City area. Media Awareness Webinar Coming Up! 1. Reports back from people’s efforts to contact their representatives in the US House and Senate regarding net neutrality. 2.1. Lewis Friedland, professor of journalism at the University of Wisconsin and author of important publications on media and democracy (https://journalism.wisc.edu/sjmc_profile/lewis-a-friedland/). 2.2. Rev. Timothy Hayes, Jr., the Interim President of the United Minority Media Association (UMMA), who is 25 years old and has built a church on social media and can likely help us replicate that success in improving media and democracy here in the greater Kansas City area — and the world. 2.3. David Barsamian, founder and director of Alternative Radio, a Boulder, Colorado-based syndicated weekly public affairs program heard on some 250 radio stations worldwide. (https://en.wikipedia.org/wiki/David_Barsamian). For more on Spencer Graves’ thoughts on the webinar series, see “https://en.wikiversity.org/wiki/Webinars_on_media_and_democracy”. For more on my thoughts regarding the afflictions that humanity inflicts upon itself, see“https://en.wikiversity.org/wiki/Net_neutrality_and_%27Restoring_Internet_freedom%27” and “https://en.wikiversity.org/wiki/Winning_the_War_on_Terror”. Reminder – Saturday 8/12 KKFI annex room, FCM member meeting to vote on bylaws changes and discuss UMMA support. THEY WANT TO TAKE AWAY OPEN-ACCESS TO THE INTERNET! The 5 major corporate media companies control over 90% of TV and radio stations and newspapers. They want to control Internet content as well. Why do “they” want to do this? To make a ton of money and to promote political agendas which censor opposing points of view. What is protecting citizens from “them” now? “Net-neutrality”. This means everything on the Internet is equally accessible and the Internet should be a place where many ideas compete equally with big money. In 2015, the Federal Communications Commission (FCC) put into place protections to ensure that service providers could not be allowed to discriminate against content without a court order. The Trump Administration wants to do away with this protection. How can “they” do this? The FCC has the power to change or discard the rules governing the Internet. When people use the Internet, they expect something called “net neutrality” This is keeps telecommunications companies like AT&T, Comcast and Verizon from slowing down or blocking any content or websites they don’t like. In 2015, the Federal Communications Commission (FCC) adopted net neutrality rules that keep these companies from censoring the Internet. A decade earlier, Comcast was caught doing that. When this was revealed, in 2014, it contributed to activism that generated 3.7 million comments to the FCC about this issue. On May 18, 2017 President Trump’s FCC approved a “Notice of Proposed Rulemaking (NPRM)” “on restoring Internet freedom” to restore the “freedom” of telecoms to censor your Internet. The deadline for original comments on that NPRM was July 17 with a deadline for “reply comments” of August 16. No matter what a person’s Internet concerns are, preserving it should be important. If the new FCC rules are allowed to stand, progress on many issues facing our nation will be blocked. Net neutrality threatens many of the world’s elites because their attempted control over the media is threatened. On July 15, FCM hosted a Forum that featured Ernesto Falcon, an attorney and Legislative Council with the Electronic Frontier Foundation, a leading citizen advocacy group focused on the law of the Internet. Falcon was interviewed by FCM’s Spencer Graves and Tom Crane with additional comments Gordon Elliott. On August 5, FCM will update the audience on the arguments presented on both sides and what they might do to better protect their interest. 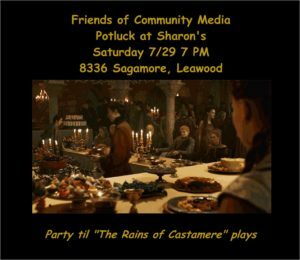 and have a good time Saturday 7/30/17, 7-PM at Sharon’s house! What is the Friends of Community Media group? FCM is a group of your neighbors that promotes community-based media including the Internet, who educate citizens on the media, and who want media to be responsive to the public-interest in their coverage. FCM is currently very worried about that a very few large corporations and money-people want to do away with Internet protections gained under the Obama Administration. This is known as “net neutrality” – or an open-Internet for all. What do the money-people want to do to the Internet? Under the Trump Administration, the danger is that a few money-people and large corporations want to make you pay more to access the Internet at a reasonable speed, and probably control what you see or don’t see. They use the name, “The Restoring Internet Freedom” rule where their use of the word “freedom” is really a smokescreen for turning the Internet over to moneyed interests and enacting Internet censorship. What can ordinary people like us do? Join the resistance by letting your voice be heard at the Federal Communications Commission (FCC) by August 15th with comments on what has been posted on the issue. Almost 10 million already commented to the FCC – most are against dismantling net neutrality – and others are bots from large corporations that are in favor of the new rules. What can I do and what should I write?